The coach of Scottish Premier League side St Mirren has expressed his disappointment after Algerian Karim Kerkar pulled out of a move to the club. Gus MacPherson had offered a contact to the 30-year-old midfielder, and says that Kerkar gave his word that he would sign. "Karim Kerkar agreed a deal with us on Friday but come the following day he had a change of heart," MacPherson told www.saintmirren.net. "The player has been left knowing in no uncertain terms just exactly what our feelings are in regards to this U-turn. "The frustrating part is that he had agreed on everything and was coming into the club on Saturday to sign the deal but he didn't show up." Kerkar is a free agent, and his reasons for backing out of the move are not clear. "He came, he looked, he played, impressed, agreed a deal, then had a change of heart which only he can explain," said MacPherson. 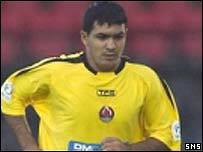 Kerkar, who has seven caps for the Desert Foxes, had been in the UAE with Al-Wadha. He has played for Scottish clubs Dundee United and Clyde.